Looking to make a strong statement about your brand? Then look no further than our custom printed Natural Kraft Paper. Don’t worry about wandering far when looking for where to buy Kraft paper, this brown paper medium weight Kraft paper sheet is great for every day restaurant use and high end food presentation. If you’re looking for a custom printed Kraft paper that’s both dependable and durable, and also Eco-friendly, then we have this item in both sheets and rolls available. 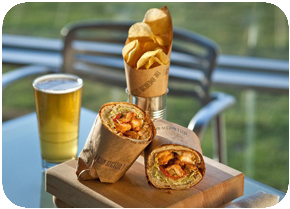 Natural Kraft Paper is a great option for anyone trying to decrease their carbon footprint in the food service industry. Excellent food service presentation sheet! 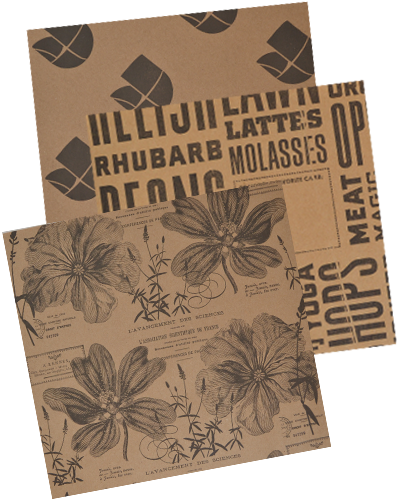 Our custom printed Natural Kraft Paper is the perfect eco-friendly food packaging solution! How much brown kraft paper do I need to buy for a custom printed order? The minimum order for custom printed Natural Kraft Paper is 3 cases = 3,000 sheets, OR 5 rolls = 3,500 feet (700 feet per roll). Delivering short run custom printed food service products is what we do best! How long will my brown wrapping paper order take? Lead time for custom printed Natural Kraft Paper is 6-8 weeks. Contact one of our sales staff today if you need to your order delivered sooner. What are your standard brown paper sheet sizes? Can I get two colors for the price of one with my Kraft paper order? If you have more than one shade of a specific PMS color in your logo then YES! We have the ability to add 1 or 2 screens to your print if the colors in your logo allow for it. Our talented design team will provide all the help necessary to solve any artwork challenge. Can I use a greyscale photo in my Kraft paper artwork? Food service paper is printed using 2 spot PMS color technology. Grey scale photo images do not translate well onto custom printed food wraps. Line artwork always looks the best. Make sure you submit Adobe Illustrator, .EPS or high resolution PDF files for proofing requests. Bitmap images are not good enough quality for proof or plate making, and are not accepted. Need a price quote on custom printed Natural Kraft Paper? Contact us today!